The Portsdown 20180515 Software Release is specially designed to enable easier participation in the IARU International ATV Contest. The added features are described below. 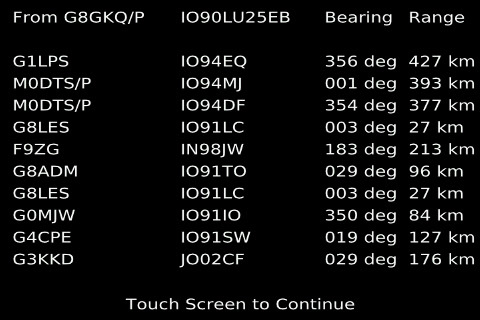 From Menu 2, The "Locator Bearings" button enters the Bearing/Distance calculator. After selection of the button, the keyboard appears for the user to enter the callsign of the distant station. After entering the callsign, a second keyboard is displayed to enable the entry of the distant station's locator. Six, 8 or 10-character locators are acceptable; invalid locators are not accepted and cause the keyboard to be refreshed. 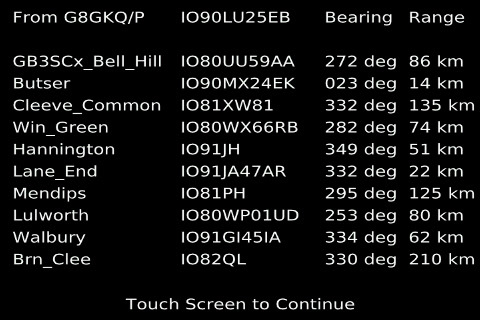 After entering a valid locator, a list of the 10 most recent calculated bearings and ranges is displayed. Touching the screen again causes it to return to Menu 2. To immediately display the recently entered bearings and ranges without entering a new distant station, select the "Locator Bearings" button and then press enter on the keyboard without entering any text. Entering a new distant station knocks the oldest entry off the bottom of the list. The "Sites/Bcns Bearings" button on Menu 2 displays a list of pre-determined locations (which can be beacons, portable sites or simply frequent contacts). The list has been pre-populated for common sites and the South of England, but can easily be amended. The pre-determined locations can be amended from the "Amend Sites/Bcns" button on Menu 3. This brings up 10 buttons, one for each pre-determined location. The location name and locator can be amended. There is no cancel button on this menu; to exit without changing anything, simply select one of the sites and press enter twice. To enter your own locator, select the "Set Call, Loc & PIDs" button on Menu 3, then select "Locator". You can then enter a 6, 8 or 10 character locator. The first 6 characters are saved for use on the Contest caption and on the TCAnim banner. The full 6, 8 or 10 characters are saved for calculating ranges and bearings. Note that you will need to re-enter your own locator on initial update to this software release. The Raspberry Pi provides an ideal video source for analogue video transmitters such as the 5.6 GHz FPV equipment. The Portsdown software "Comp Vid" output mode has been designed to take advantage of this capability. Note that the VIDEO OUTPUT IS NOT AVAILABLE IF YOU ARE USING THE 7 INCH SCREEN. First, select the "Output to" button on Menu 1 and then select "Comp Vid" as the output device. Selecting "TX" on the Main Menu will set the PTT on, and select the 71 MHz band output. This allows you to control your analogue video transmitter PTT from the 71 MHz PTT output. Menu 4 will display on the screen (and on the video output). From Menu 4, you can select the PTT off, and back on again. You can also select a band to determine which Contest numbers are displayed. Selection of this band does not affect the digital transmission band, simply the captions on the Contest numbers page and the TCAnim banner. Selection of any of the 5 video source buttons directly selects the appropriate video source. Selection of Pi Cam outputs the picture from the Pi Camera. Selection of "Contest" brings up a caption page with your callsign, the Contest numbers for the selected band, your locator (6 character) and the band name. The Contest numbers will need to be pre-entered by selecting "Set Band Details" on Menu 3; the default numbers are not valid for use in the contest. "TCAnim" brings up a test card with the bouncing balls and a scrolling banner; the movement appears jerky on a Waveshare touchscreen, but is perfectly smooth on the video output. Selection of "Test Card" initially brings up Test Card F with your callsign overlayed (the callsign caption can be disabled from the "Caption" button on the Main Menu). Additional test patterns (without captions) can be selected by touching the right hand eighth of the screen below the half way point as shown shaded on the image below. 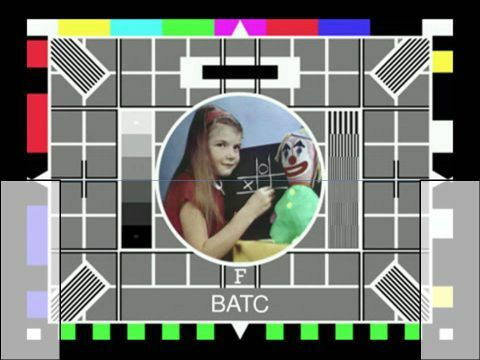 Touching the left hand eighth causes selection of the previous test card; touching anywhere else on the screen selects the Video Output Menu. The patterns available are Test Card F, Test Card C, PM5544, 75% Colour Bars, 11-level greyscale and "Pulse and Bar". The video quality is surprisingly good - look at the pulse and bar on an oscilloscope! Selection of "Snap" enables the display of the still composite video snapshots taken from the "Snap" button on Menu 2. The latest snap is displayed by default, and the previous snaps can be shown by touching the left hand eighth of the screen below the centreline. As with the testcards, the selection can be reversed by touching the right hand eighth and cancelled by touching anywhere else on the screen. If a USB sound dongle with an output socket is connected, the input from the Microphone will be amplified (slightly delayed) and output from the sound dongle output socket to be fed to an analogue video transmitter. Previous software versions provided this output on the Raspberry Pi audio output socket, but this socket's use of the Raspberry Pi's Pulse Width Modulator then disabled Portsdown video transmissions until the RPi had been rebooted. The Snap Check functionality on Menu 2 has been upgraded to allow the viewing of all the previous snaps using the same left/right hand eighth below the centreline buttons as the test cards. Use of the RPi audio output for RTL-FM also disabled any digital video transmissions until after the next reboot, so by default this software version uses the audio dongle output for RTL-FM. If no audio dongle is detected, the Raspberry Pi audio output is used, but no digital video transmissions are possible until after the RPi has been rebooted. A number of the Menus have been modified to include selections for the LimeSDR Mini and the transmission of DVB-S2. This capability is planned for future Stretch software releases (it will not be available with the older Raspbian Jessie), but it is NOT included in this release. Successful DVB-S2 transmissions have been achieved in a development environment, and it is hoped to release this functionality within a few months. This page was last modified on 18 May 2018, at 12:06.